The VATS system (Vehicle Anti Theft System), also known as PASS-Key (Personal Automotive Security System), was introduced by GM in the 1986 model year on the Corvette as a reaction to increasing Corvette thefts. Later the system was introduced in more car lines and the improved successors were named PASS-Key I and PASS-Key II. The GM locking steering columns (as used in all GM vehicles, including the Fiero) can be defeated very easily with brute force. BTW, the same company that makes the locks also makes a lock breaking tool. Go figure. Anyway, basically all you need is brute force and the car is yours. GM wanted to introduce a low-cost system that eliminated driver involvement, and the PASS-Key system was born. 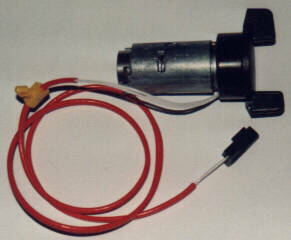 The Pass Key system works by embedding a small resistor pellet in the ignition key, as seen in the picture. A controller module checks the resistor value and prevents starting of the engine if the incorrect key is used. The system disables the starter for 2-4 minutes before allowing another attempt. Jumpering the starter won't help, because the control module disables the ECM's injector drivers as a second line of defense. The 2-4 minute shut down time must elapse before another attempt may be started, even using the correct key, or the timer resets and the 2-4 minute countdown restarts all over. Once the 2-4 minutes are over with the ignition off, the system resets and the correct key with the correct resistance starts the engine. So removing the ignition lock won't help the thief, he'll also need to know the proper resistance for the key to start the engine. There are 15 different values (see table below), so it takes a thief up to an hour to try all possible values. Since a thief can calmly try these combinations at night, you need a good alarm in addition to the PASS-key system. GM should have used more than 15 values and more than 4 minutes shutdown time to make it more difficult to circumvent the system. The tolerance for each value is supposed to be +/- 15% though, and that makes a significantly larger number of resistance values impossible. But I digress. One problem of PASS-Key systems lies in the resistor sensing itself. If the pellet or contacts in the ignition lock cylinder don't make proper contact and give a false reading, you can't start your own car anymore. The aftermarket has come to the rescue and offers devices that consist of nothing more than a resistor and maybe a switch for ridiculous prices. You can just set a variable resistor to the proper value, and wire it in the system instead of the lock cylinder connector. The 86-88 PASS-Key system used a different controller for each of the 15 resistor values, the 89+ PASS-Key I module learns the value of "its" key the first time the ignition is turned on. This second generation system also provides a ground for a security lamp, and in order to do so even with the ignition off has both a switched and unswitched battery voltage inputs. The PASS-Key II system has some more diagnostic output via the security lamp. The module outputs include both a ground for a starter relay as well as a 60Hz output to the ECM. This is the signal that enables the fuel injector circuits. The behavior of the lamp differs slightly for the PASS-Key I and II systems. On the earlier system, the lamp is on for two seconds while the module measures resistance, and goes off it the right key resistance was recognized. Otherwise the lamp stays on. The newer system also has the bulb test mode of the earlier system, but it also turns the lamp on if a fault was found in the system (as short to ground, short to battery, wrong resistance, etc.). If the wrong key is inserted, the indicator stays on and the module starts the 3 minute countdown. If the key has no resistance or there is a short the lamp flashes and starting is also prevented, but there is no lockout period. So I compared the PASS-Key ignition lock (The part number for the lock cylinder is #26033390, and the price was about $60) with the standard GM lock without PASS-Key and found the dimensions of the lock cylinder itself to be identical, so it basically fits the Fiero column! The problem is the collar. The collar contains the contacts for the resistance measurement and is slightly longer than the standard Fiero collar (the key is longer as well, BTW). The real problem though is that the collar is about 0.1" more in diameter than the original lock cylinder collar. The Fiero column lock opening needs to be widened a little bit to accomodate the larger collar. Also there is no provision to feed the orange wire into the column. So, there is plenty of space inside the column, but the lock cylinder housing would have to be modified if you want to use the new ignition lock with the original lock housing. But there is hope: the only GM car with VARS without an airbag ist the 89 Camaro. According to Rick Lanza of Column's galore "the lock housing will fit perfectly, the part number is #2600 8794, and the cost is $53.40". I will definitely give that a try soon! Once the mechanical part has been taken care of either a GM Pass-Key module can be used (either new or from the junkyard), or I'll design an improved module that eliminates the shortcomings of the GM module. The key (no pun intended) is that the thief doesn't expect this system on a Fiero so he won't know how to defeat it. And the advantage of designing my own module will make his life miserable even if he is familiar with the original design. I finally got the part numbers for the connector pigtails, they are #12085535 for the lock side and #12085481 for the wiring harness side. Watch this space for the latest on this ongoing project! So, to summarize the addition of the PASS-Key system to the Fiero seems possible, with the only problems being of mechanical nature. Maybe the lock cylinder housing from a different GM car fits the Fiero column (which, after all, is a generic GM column)? Also, what are the part numbers for the control modules and connectors? If you have any information that can help me with this project, please email me. GM, VATS, PASS-Key, PASS-Key I and PASS-Key II are registered trademarks of the General Motors Corp.